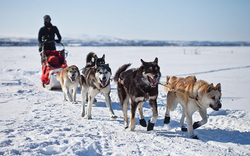 The Iditarod celebrates the mushing history of Alaska. The Denali sled dogs are the only sled dogs in the United States that help protect a national park and the wildlife, scenery, and wilderness therein, and it has been this way nearly as long as there has been a park here. They have a cultural significance, representing both the Native Alaskan and the pioneer experience in the far north; and have a role in the history of Alaska's first national park. Denali National Park and Preserve hosts the US government's only dog-sled team. It can be hard to get here, but you can bring Denali into your classroom instead! The education staff at Denali can visit your classroom for free via the internet if your school has the ability to use Skype. Using a videoconferencing connection, the staff will spend an hour teaching your class about Denali's amazing natural resources using interactive lessons and activities. Show the post video activity "Cabin Life" after the Denali skype visit, or to take glimpse at cabin life of a Denali Park Ranger! Become a Denali Park Ranger! Click the link below to find information about how to earn your ranger badge! Have a Denali Park Ranger Skype with your class! Go on the site, or open the form below and email it in!